The Avocent HMX Advanced Manager HMXAMGR24 is a control suite which transforms extenders into a digital matrix solution. Using standard IP infrastructure it is possible to route any user station to any computer attached to the network without any compromises to video quality or control. It allows cooperative sharing of computers and the multicasting of video to any destination. 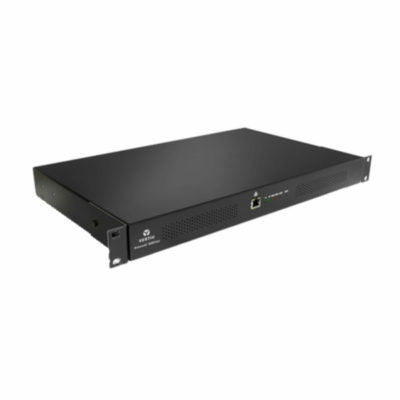 The Avocent HMX Advanced Manager (HMXAMGR24) is a control suite which transforms extenders into a digital matrix solution. Using standard IP infrastructure it is possible to route any user station to any computer attached to the network without any compromises to video quality or control. It allows cooperative sharing of computers and the multicasting of video to any destination. Secure access and communications Using TLS (transport layer security) and HTTPS, communications between HMX units and the HMX Advanced Manager and between the HMX Advanced Manager and the outside world are all secure. Redundant operation For 24/7 reliability a second HMX Advanced Manager can be added to ensure constant uptime and with dual NIC interfaces on every HMX unit, systems can be easily designed for maximum resilience. User access rights management and audit trails Administrators can manage access rights to each device on a user by user basis either manually through the web browser or automatically using Active Directory. Reports showing the history of devices, user logins and device connections can be viewed and exported to a CSV file or via SYSLOG. Control Channel and Presets connections The HMX Advanced Manager can be used to make connections between an individual pair of transmitter and receiver devices centrally from within the management system. Using Presets, a list of pre-defined connections, multiscreen, video wall or signage setups can be forced with a single click. SNMP v3 get / walk External machines can interrogate the HMX Advanced Manager to find out the status of the network and units. SNMP v3 security is imple-mented, supporting AES/DES transport with MD5/SHA authentication. 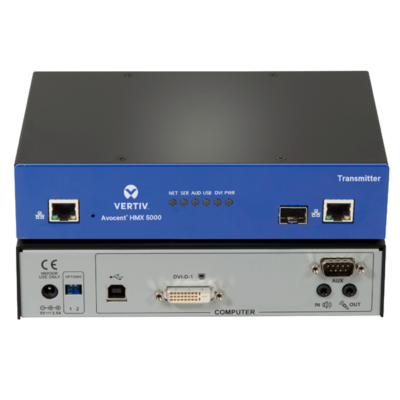 External NTP server support – NTPv4.2 Connect up to 3 NTP servers with authenticated connections using MD5 and Key ID as defined in the NTP standards. Centralized firmware upgrades As well as managing its own firmware upgrade, The HMX Advanced Manager manages the upgrade of each device on the network and can deploy firmware to hundreds of devices at the same time, meaning a system-wide upgrade takes only a few minutes. 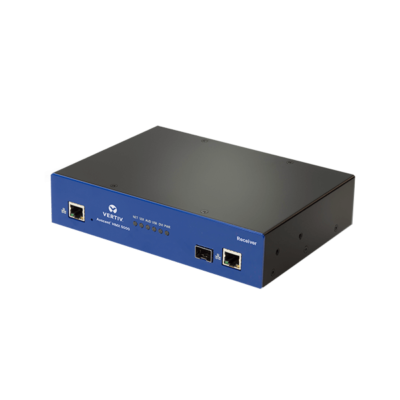 Easy matrix setup Using Zero Configuration networking, the HMX Advanced Manager automatically obtains the MAC addresses of extender devices as they are attached to the network. The administrator allocates IP addresses, names and locations so that devices are easy to identify, configure and control. On screen display (OSD) at each user station – Users log in and choose channel connections from an intuitive OSD similar to that of a Digital TV. Users can also use Presets to change channels for multiple screens across multiple receivers. Easy centralized management – Accessed via a web browser, the dashboard gives a real time over-view of system connections and users. Tabs enable you to navigate between settings and device or user sub-menus. Capacity – Included license supports 24 registered endpoints. Hardware – Industrial spec server with solid state memory. System Connections – 2 x RJ45 Gigabit Ethernet, 1 x RS232. 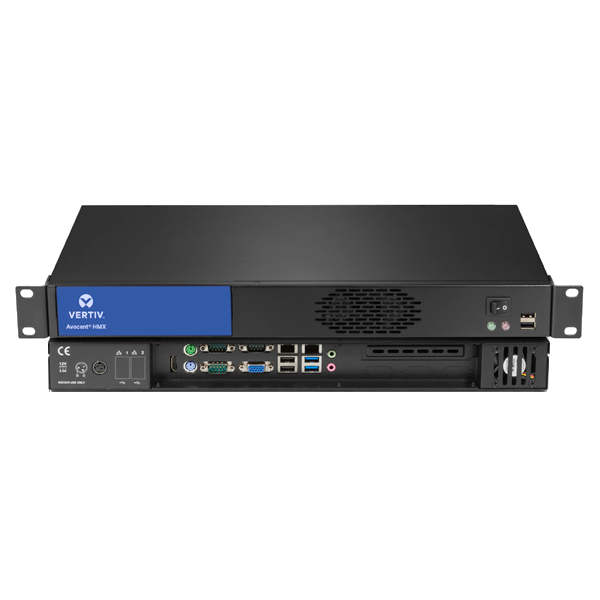 Physical Design – 19 inch 1U rack mountable chassis in a ro-bust metal construction. 432mm/17″ (w), 44mm/1.73″ (h), 230mm/9″ (d), 2.75kg/6lbs. Power – External power IEC input unit, 100- 240VAC 50/60Hz, 1.5A, input to power adapter. 12VDC, 60W output.